Living room of a chalet with forest and mountain view. So you’ve purchased your first home in Wisconsin after weeks – maybe even months – of house hunting and negotiating. Congratulations! Now you’ve come to the next exciting part – moving in and decorating the home to make it truly your own. If you’re like most first-time homeowners, you’ll likely be met with some challenges, like limited budget and space. This means you have to choose your furniture and accessories with care. Start with the most essential pieces that will last a long time without burning a large hole in your pocket. Make a list of basic furniture pieces that you can’t do without and build your interior around them. Check your bedroom/s to determine the size that you’ll need and would comfortably fit without cramping the space. If you’re living with your spouse, you might want to get a queen or king-size bed. If you have more than one kid, bunk beds can help you save on space. A day bed – or one that converts from a couch to a bed – is a great option for small spaces. If you have limited space, a multipurpose table that you can use for dining and working would be a good choice. Look into square or round tables that may be extended to seat more. Choose sturdy chairs that’s will look good with the space and are proportionately sized. Wooden chairs typically cost less, but chairs with upholstery are more comfortable. If you see yourself spending more time at your dining table, upholstered chairs might be the better option. 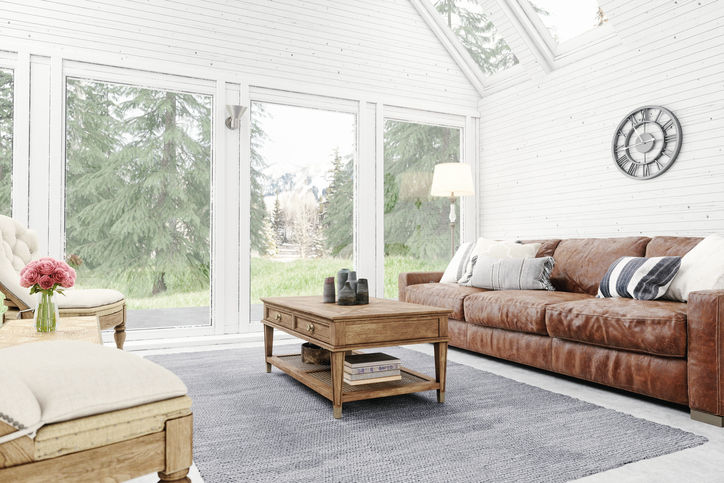 A sofa will most likely be the second most used furniture in your home after the bed. Choose a classic long-lasting piece that fits your budget. Check the upholstery and frame materials and assess their durability. Avoid getting the lowest-priced sofa that will probably tear apart or break down after a short use. Go for neutral colors that will work well with any decorating style, and simply add pillows to create accents. Storage can be a challenge for smaller spaces, but is absolutely essential. Look into pieces that will not take up plenty of space, such as a chest of drawers for the bedroom, bathroom, hallway or living room. An armoire is also great for organizing clothes or entertainment appliances like the TV, speakers, and others. Choose pieces that can also work as accents for the room. Consider furniture with built-in storage as well, such as an ottoman with hidden shelves or a bed with drawers. Good lighting can go a long way towards enhancing the mood and beauty of your home. Choose energy-saving bulbs, particularly LED and CFL. Floor lamps are excellent space-saving options if you don’t have room for side tables. On the other hand, table lamps next to your bed provide convenience. Make sure you get the right amount of luminance for the size of the room. Ready to make the move to Bayfield, Ashland or Wayburn? Call By the Bay Realty at 715-682-7337 or get in touch with us here.